Nothing is worse than a green pool in the heat of a Phoenix summer. Not only is this a huge disappointment that you cannot cool off in your pool, but it can also harbor some very serious health risks. Bacteria and germs are present in every green pool, and it can also be a breeding ground for mosquitos which can carry West Nile Virus, St. Louis Encephalitis, Dengue, and the Zika Virus. But the good news is that a single call to 480-969-1911 EXT 228 can schedule your service appointment with a Unique pool service technician who specialized in cleaning green pools! 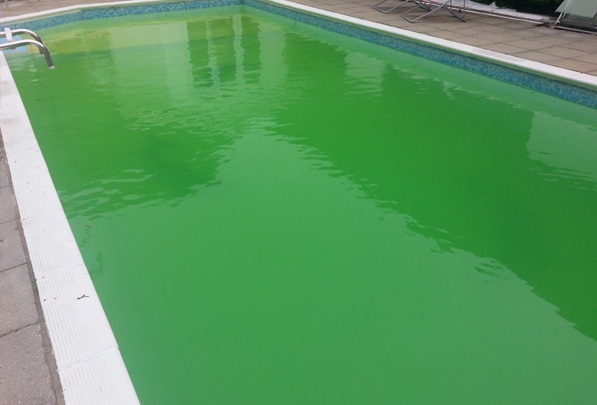 The green water immediately tells you that there is algae growing in the pool. The question is how bad is the algae growth. To answer this important question, look into the water to determine if you can see into the water and if so, how deep you can see. The best place to do this is at the steps. If you can see about 8 inches into the water, which is the bottom of the first step, then the water can be cleaned with chemicals. If the water is so green that you cannot see to about the bottom of the step then you are likely going to be far better off to drain the pool, acid wash it, refill it and begin to add start-up chemicals. A Unique pool service technician can begin the process of chemically cleaning your green pool as long as the pump and filter system of the pool are fully functional. In most cases, the technician will add chemicals to begin killing the algae and then program the pump to run for 24 hours to filter out the debris. After the 24 hours of filtration, the technician can test the water and begin the process of balancing the water, as well as brushing the walls and floor of the pool. The balancing process is a critical step as that will make the water safe for swimmers. If your pool is too green to see below the water surface then trying to clean it with chemicals is going to be more time consuming and expensive than draining the water and acid washing the pool’s interior. In some extreme cases, even after draining the pool there are stains on the interior and lingering algae. Your Unique pool service technician will use an acid wash or a chlorine bath to remove the stains and any persistent algae. The chemicals remove a thin layer of the plaster or pebble to reveal a fresh clean look. In addition, this removes any algae that could be in microscopic cracks or seams in the finish. Once the pool shell is clean, it is also important to clean the filter system to be sure you are reintroducing algae into the clean pool from the pool equipment. With both of those tasks completed, it’s time for your technician to begin to refill the pool and add the startup chemicals. It is important to understand that there could be some underlying issues that contributed to your pool turning green. Your Unique pool service technician will evaluate all of your pool equipment and advise you of any additional repairs or replacements that are necessary to maintain your pool in a clean and safe manner after the initial green pool issue is corrected.